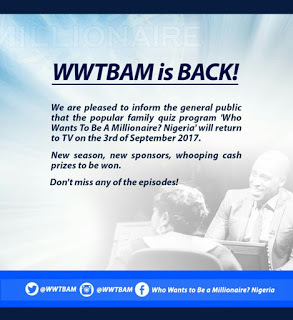 Who Wants To Be A Millionaire Is Back! Sometime earlier, same thing that happened to the now 9mobile happened to the TV game show, Who Wants To Be A Millionaire. Her major sponsor MTN pulled out and unlike the telcom network that simply changed name, they just had to shut down operation. There is good news!!! the Tv show is about to go operational again! For me, I’m just glad they are back and can’t wait to see Sir. Edoho scaring people again and yet knowledge we gain. Expected Time Of Resumption : 3rd, September 2017.
https://www.betayarn.com/wp-content/uploads/2019/02/btl.png 0 0 Cirphrank https://www.betayarn.com/wp-content/uploads/2019/02/btl.png Cirphrank2017-08-29 23:15:002017-08-29 23:15:00Who Wants To Be A Millionaire Is Back!